Saturday Morning Slam 03-30-13 - WrestleCrap - The Very Worst of Pro Wrestling! So sez our erstwhile announcer to start off the show. Ok not really, just seeing if anyone was paying attention. And SPEAKING OF…paying attention, a quick note that RD Jr. has started soccer season, and his practices are Saturday mornings at 11am. Sadly, this means that the weekly live reports/chats on Facebook are on hiatus for now. However, do not stop doing your own commentary, fellow Crappers, as I will use the best of them on these reports here on the site! Our opening contest this week will feature the bulbous dancing duo of Brodus Clay and Tensai versus the (always humorously named on SMS) Prime Time Players. As I recall, that was set up last week in a train wreck of an ep I’ve tried to forget (largely due to this image). While this bout doesn’t fill me with hope, there is no Miz or Brad Maddox in sight, and that is a very, very good thing. Let’s spin the SMS Commentator Wheel of Misfortune™ and see what we get. I am also pleased that Brodus and Tens…err, SWEET T now sport matching Gilligan hats. And I am pleased that this show never seems to calculate hot pants (which the girls on here always wear) into their G-rating. Better yet, Mick Foley is apparently considering having D-Bry as his assistant GM on this show. This leads to The Dazzler (!!!) to talking about what a great job Foley is already doing. Yes, in the one show that he was in charge of, which I will again remind you was horrible. 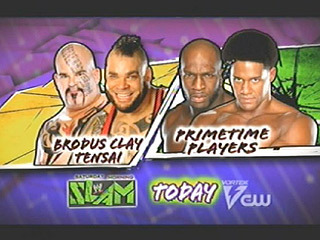 Brodus starts off with Titus, who begins wrestling with a whistle in his mouth. The first move of the match is actually Titus attempting a body slam, which fails. His solution? To immediately tag out. Ok, that was pretty funny. Unfortunately, it causes his partner to quickly become subject to a massive pummeling, including the return of one of Mabel’s old moves, which I lovingly refer to as “The Attack of the Falling Down Fat Man”. Didn’t really understand that move in 1994, don’t understand it today. Discussion of Tensai’s tattoos commences, as he got them without knowing what they mean. The tattoo discussion somehow leads to The Dazzler noting that wrestling Tensai is like wrestling a bear. According to him, you can’t be a true champion until you’ve wrestled a bear…which, of course, he has. Gene LeBell did, and so did Stu Hart. Apparently Arn Anderson has as well. I strongly suspect that is a lie. I would, however, pay to see it. Back in the ring, Young and O’Neill steal the old Rick Rude-Ultimate Warrior finish from WrestleMania V and pick up the win. 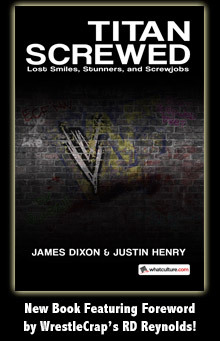 However, Mick Foley comes out to say that he saw the chicanery involved in them getting the victory, and while he can’t overturn the referee’s decision, he can sign these two teams to an immediate rematch, causing Young to bite his nails. And I don’t mean figuratively. HE LITERALLY BITES HIS NAILS. This move by Foley causes D-Bry to talk about what a brilliant decision this is as we head to commercial. When we get back, Josh claims that The Dazzler has done nothing over the break except talk about what an idiotic decision it was, which, of course, he says is patently untrue. Alright, the concept of back slapping shill Daniel Bryan, who then bad mouths every one during commercial, is one that really deserves to be fleshed out; it has hilarity written all over it. No earthly idea what he was going for there, but umm, it didn’t work. A double splash by the T & Brodus gets them a ticket to the pay windah, which is notable solely due to the fact that D-Bry notes it Young was hit with “1,300 pounds”. “Notable”, I say, because earlier in the match D-Bry claimed Tensai was 367 pounds. Therefore, by my math, that means that Brodus weighs 933 pounds. Somewhere, Art Donovan is nodding his head in approval. The girls celebrate by going for what looks to be some kinda lesbian dance move, which Brodus & Sweet T also attempt. I have no idea where this bear thing came from, but it’s money. So we head to commercial, and when we get back, Antonio is telling the children not to try his moves at home. I should note that the previous commercial break, the CW announcer told us to “work on your signature move during the break” while showing a dude get back body dropped into the lights. That’s mixed signals to say the least. Do I trust the nameless, faceless guy who’s never done me wrong, or the guy I see breaking the rules every week? In the ring, Cesaro starts working the ribs, while Bryan continue discussing bears. ALL KINDS ALL KINDS OF BEARS. And when Cesaro locks in a bear hug, the reaction is exactly as you’d expect! Truth is able to escape, however, and goes for a sunset flip. A sunset flip on Antonio Cesaro? You know what that means! 30 seconds of selling in the form of a 12 terabyte animated GIF! …30 seconds (and 12 more terabytes) of a giant swing! Not that it matters, but Truth wins. 14 Responses to "Saturday Morning Slam 03-30-13"
Daniel Bryan in SMS = PURE Gold. 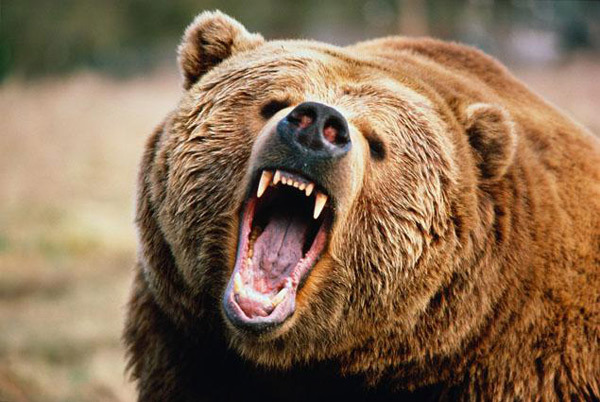 If anyone needs prove of Daniel Bryan wrestling a bear, look no further than the latest JBL&Cole show! I greatly look forward to this review each week. Keep up the good work! 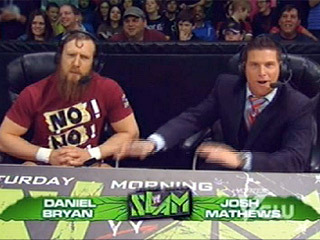 Daniel Bryan did wrestle a bear on the JBL & Cole Show. I thought that may have started his bear fixation. Okay that is easily the funniest thing I’ve seen in a while. Also now I keep hoping Bryan gets a “Protector of the Russian skies” gimmick. The Dazzler is greatest wrestler and commentator in the history of the WWE. My wife was looking at me like I was the craziest person on the planet while I watched this show live. I couldn’t help it, I laughed for 30 straight minutes. This is the most fun wrestling program out there. It should be required watching. IMAGINE DOING THIS TO A BEAR!!!!!!!!!!!!!!!!!!!!!!!! Also, kudos to Claudio for unwinding himself to regain his bearings after the giant spin. My personal favorite part being him screaming “there you are” at R Truth. SMS + The Dazzler + Bears = MONEY!